There's one thing that I detest about graphic novels: THEY'RE SO DAMN EXPENSIVE! Also, the shop where I buy graphic novels (because they have good discounts) is 12 miles away from me, so I don't get to buy them for cheap very often (hopefully I'll be able to get my friends to journey that far so I can buy more often). I'd first heard of this story arc was on the special features of the Batman Begins DVD. The movie was somewhat inspired by this book and was highly praised by Christopher Nolan and David S. Goyer. There was also a feature on the DVD where various Batman writers and artists were talking about Batman's various incarnations. I think that The Long Halloween was mentioned, but it's been a while since I've watched it so I may be wrong. 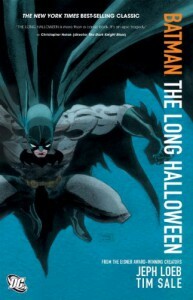 The cover of this edition doesn't really say much about the book other than that this is a Batman story. The cover of the previous version is better as its elements relate to the story, rather than just a picture of Batman and nothing else. I would have preferred something similar. When I first read the blurb, I immediately assumed that the killer would be Calendar Man. I was pleasantly surprised to find that it wasn't; that made solving the mystery myself even more fun. I loved how each chapter (or issue) was centred around a holiday (the first and last being Halloween) and a specific villain was allocated to each (Poison Ivy appearing on St. Patrick's Day, for example). I know that this book shouldn't make me laugh, but the Falcone family is so much like the Corleone family (from The Godfather) that is made me laugh a bit. There's even a panel in which Carmine Falcone sniffs the rose on his dinner jacket in the exact same way as Don Corleone. I kept hoping for him to make "an offer he can't refuse". I love Godfather references, but I expected Falcone to be a more original character, rather than a moral-lacking Don Corleone in Gotham City. I loved seeing Harvey Dent's transformation into Two-Face. The story of him and his wife Gilda really emphasises Dent's madness and obsession with duality better than if he was a loner and din't have anyone. I could see where the inspiration for Batman Begins and The Dark Knight came from clearly. I love how this book felt like more of a detective story rather than a superhero story, mainly because the mystery isn't fully solved. Even though the suspects are narrowed down to Alberto Falcone (who is sentenced to death), Harvey Dent (who is thrown into Arkahm Asylum) and Gilda Dent (who confesses in soliloquy and burns the evidence) it is never revealed who really is Holiday and that has left me wanting a sequel/continuation to this arc. I'm not sure if there is one, but I will hunt! Guess who is in this book that I hate with a burning passion? That's right, Catwoman! I've explained my reasons for hating her in a previous review but I will briefly explain again; she doesn't provide much of a use other than creating sexual tension. Other than her uselessness, her mere presence annoys me and it appears to me that she is only present here so that Bruce Wayne has a girlfriend who is unimportant to the main plot. She's also a pretty pathetic excuse for a villain. Two of my favourite villains are in this book; Scarecrow and the Mad Hatter. I never really see them much (a sign that I need to read more Batman TPBs) and, to me, they go together like salt and pepper. The perfect combination of hallucinogen-spreading maniacs! I liked how they worked together but seemed indifferent to each other or maybe didn't like each other. I understood why Mad Hatter was reciting lines from Alice in Wonderland and Through The Looking Glass, but what I didn't understand was Scarecrow reciting Sing a Song of Sixpence to himself. I didn't understand what that was about. I liked the Gordon that was shown here. He seemed a bit softer and easy-going, like Gary Oldman's representation, probably because he isn't the Commissioner yet and is more of a family man here. In other books, he is shown to be quite cold and harsh and seeing him be a bit more laid-back (probably not the best choice of words) was a nice change. I tend to not read Batman stories by the same author all the time (Grant Morrison is an exception because he is awesome) because I love to see how he is varied with writer. Since this is an early Batman story, he is a bit more aggressive but still retains his detective skills, which was awesome to see. Villain back-stories are one of my favourite things in comic books and I've never seen Two-Face's before (The Dark Knight doesn't count). I loved seeing how his psyche deteriorated as the story progressed until Maroni chucked acid in his face and completely destroyed it. The way it was written was very nicely done. I'm quite mixed on the artsyle. I liked how it was quite simplistic and reminiscent of pop-art (to me it was) but I wished that it had more details and focused on the characters a lot more. I'm quite used to the modern artstyles that are used, such as Tony Daniel's art but Tim Sale's style doesn't distract away from the story and also showcases the action at the same time. Overall, I really enjoyed this book. The story was really well written and kept me incredibly interested; I couldn't put it down. I liked the artstyle but I wish that it was a bit more detailed and I liked most of the characters that were featured. However, the numerous Godfather references were quite unintentionally funny and the mere presence of Catwoman is a downside in any book for me. I know that I sound like a prude, but I just can't stand her.